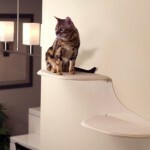 The Refined Feline Lotus Cat Tower features a beautiful design that will look good in any home. The wood frame screws together, meaning no messy glue, and it has many features that your kitty will enjoy. The pedestals, or platforms, are padded with Berber carpet that is attached to the tower using Velcro. There is also a large sisal rope scratching area for your kitties to enjoy. The hide-away has soft padding inside of it, as well as on top of it, giving your cats a soft, cushy place to stretch out for a catnap. “it’s attractive, very sturdy & well finished.” – Karen L.
The Refined Feline Lotus Cat Tower has received glowing reviews from online sources. It averages a 4-out-of-5 star rating that shows it is an exceptional product that cats love. The features that pleased most of the people that purchased this product were its gorgeous looks and its sturdy construction. It is a contemporary piece of cat furniture that looks great in modern homes. The wood construction that is held together with screws is solid, made to withstand the constant jumping and pouncing that multiple cat homes can produce. In 2011, Refined Feline used a production company to make this product that had low quality control standards. During this time this product received some horrific ratings and reviews, as customers were complaining that pieces wouldn’t align properly. Many people felt that these were design flaws you’d expect from a cheap cat house, but not from a premier piece of pet furniture. Refined Feline has since changed production companies, as well as increased their quality control standards, and since then this cat tower has received glowing reviews, as the issues have been corrected. Most of the complaints made in the online reviews were during the 2011 period, in which the company had some quality control issues. As previously stated, Refined Feline has fixed these issues, and the product has received far less complaints. The one consistent complaint that customers have made, aside from quality control, is the assembly time. Many customers were daunted by the instructions that came with the product, and felt that the time it took to put the product together was entirely too long. Hopefully, Refined Feline addresses this concern, as they have other concerns. The Refined Feline Lotus Cat Tower is a great piece of cat furniture, and with multiple jumping platforms, a tall perch, and a little kitty-condo, it has plenty of features that will keep your cat entertained and active for hours. It is beautifully designed, and made with a sturdy plywood covered in an easy-to-clean veneer, making it perfect for multiple-cat homes. This is a great purchase that is sure to please pets and owners alike.